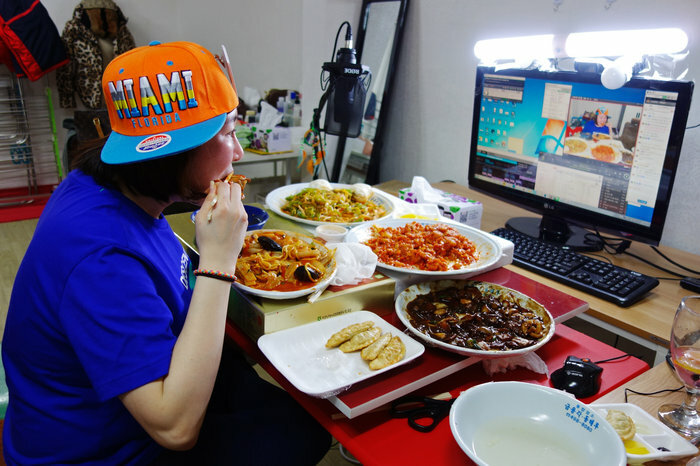 The demands on Ahn and other mukbang stars like her are high — she can’t just eat, she must eat ferociously. As she devours noodles, loud slurping is a must. Audiences offer feedback on a live stream, asking how spicy the noodles are, suggesting she move dumplings closer to the camera or do a dance in excitement. The stream continues for three hours every night. Eating is something one activity that is strongly identified as being natural, and spontaneous…You think about K-pop or K-drama [and] they’re very artificial, they’re all about makeup and plastic surgeries. And a lot of people find this — mukbang — to be the exact opposite of all the things right now Korean popular culture really stands for. Of course, describing the huge volumes of food consumed in the eating shows as “natural” might seem a stretch. I’d be curious if the binge eaters ever include a strangely popular food in Korea, Spam, the U.S. processed pork product from the 1930’s, which is particularly used to make a spicy soup known as budae jjigae, or army stew. As a language teacher, I emphasize the importance of language in cross-cultural communication. It’s one of the direct pathways into another culture – it can mean that you’re looking from inside, not outside. However, connecting with someone from another culture without knowing the language is certainly possible – and it happens all the time. I am reminded of that fact by the recent story on NPR about “Brother Orange” and the lost cell phone. We had two translators, but, you know, you’d be surprised about how much nonverbal you can do with each other. You know, how much you slept. Did you sleep well? We also, in the middle of the trip, we developed this, you know, symbol where we tapped our hearts and said happy, happy, happy, happy whenever we, you know, had a moment. And so when I think about that, that’s just big. The last morning of our trip. We don’t have a translator for this part. This is it. The journey is over. What even happened? We sit in the back of the car. We both are holding back tears. When’s the next time we’re going to see each other? What will it be like? When is he coming to New York to visit me? It’s all up in the air. In that moment, I couldn’t help but think about the boundaries we had broken down. It’s 2015 and cell phones and computers have changed everything. Language boundaries aren’t that real. We had happily chatted with each other using a translation app. There’s an app for everything. Anything is possible. Thank you, Steve Jobs. I find out that part of the reason why my story resonated so well with the Chinese is that people learned about it during Chinese New Year. Bro Orange’s nephew actually heard about my story spreading on the first night of the lunar moon. This is not an accident. It’s a sign. I start to believe more and more in the Chinese theory of destiny. 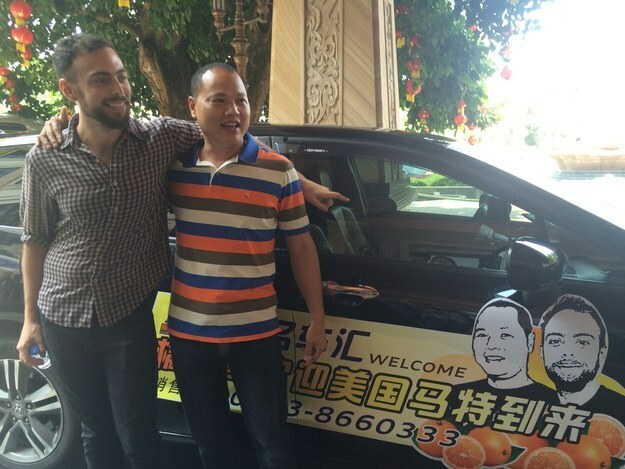 It’s big in Chinese culture and another reason why this story was so big there. This is more than just a series of crazy, random coincidences that changed our lives — it’s fate. He let me into super-personal parts of his life. I went to his childhood climbing trees, a local temple, and his parents’ house. We even paid tribute to his ancestors. I have a moment when he asks me how I pay tribute to my ancestors. I don’t have an answer. Americans don’t really do that. It’s fucked up and makes me feel bad. Cultural differences, man! The sense one gets from reading Stopera’s account of his visit to Brother Orange is that despite the language barrier, there was a deep connection made between the two men. That happened in large part because of the welcoming nature of the Chinese people, and of Brother Orange and his family in particular. But it was also made possible by the openness Stopera demonstrated in experiencing a variety of Chinese cultural experiences very different from his normal way of life and his willingness to share those together with his new Chinese friend. There’s a nice segment, for example, about his experience in the mud baths. From the many pictures included in his travel account, it is clear that for many of those experiences, no verbal exchange was necessary.